While driving the other day, I saw one of those signs that made me look twice. Not because it was a clever advertisement, but because it was so strangely worded. Okay, so it’s easy to laugh at these types of problems. But how do we avoid making the same mistakes? If you think about it for just a moment, the original intent of the message is clear. 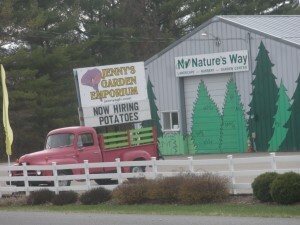 The person who created the message wanted to communicate that the business was hiring, and that they were selling potatoes or pansies (after all, it is the right time to plant them in our area). A simple message, gone awry. Why is it so easy to misunderstand the message? A big part of the problem is the fact that the words are all in the same font, and that they are too close together. A better approach would have been to hang a banner advertising they were hiring, and using the main sign for what they were selling. Anything that separated the two would have been better. Probably not the intended message. This also serves as a warning to all writers: after you write something, take a step back and look at the big picture. When you look at your work as a whole, are you sending the wrong message? Back to the signs above, it’s certainly possible that the owners did this on purpose. After all, it did capture my attention, which is the point of any advertisement. However, this is often caused by simply being focused on the little messages instead of looking at the big picture. Don’t let this happen to you. Always have someone else read over your work before you submit it for the world to see. You never know what else you might be saying.